On a weekday, we decided on a quick family lunch and were looking out for a new interesting place. So we walked into Mangalam which is located on Gangapur road. You walk across a lovely well maintained green lawn to the restaurant door which is something I really liked. The place is filled with the aroma of Manglorian cuisine. 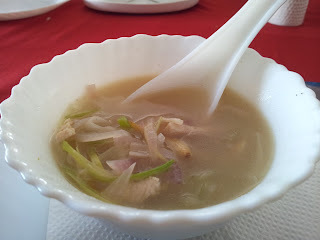 Though they also have Chinese and Punjabi dishes on the menu, Manglorian is their speciality. 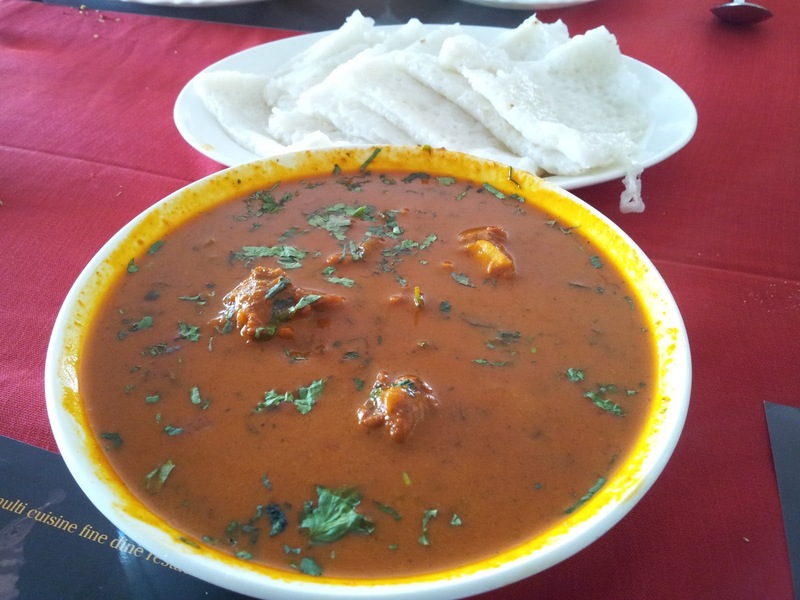 The menu is extensive and it is easy to make a choice once you have decided on Manglorian. I would also suggest that you may go with the recommendation given by Sharad. Being the owner of this lovely place he knows the menu the best. With all the smiles and the warmth that he spreads, he is the perfect host and its no surprise that he has his own chain of restaurants. Udipi Spice express- another one in the chain, which is famous for a wide range of dosas is where I'm waiting to go. So we start off with Chicken Long Fung soup which was amazingly yum. I did not probe into the ingredients which blended perfectly but what my tastebuds appreciated was the freshness. The chicken was nicely cooked too. Here's a picture and it tasted even better. That was a good start after which we were tempted to try everything chicken on the menu, so we decided to go with the Non veg platter. 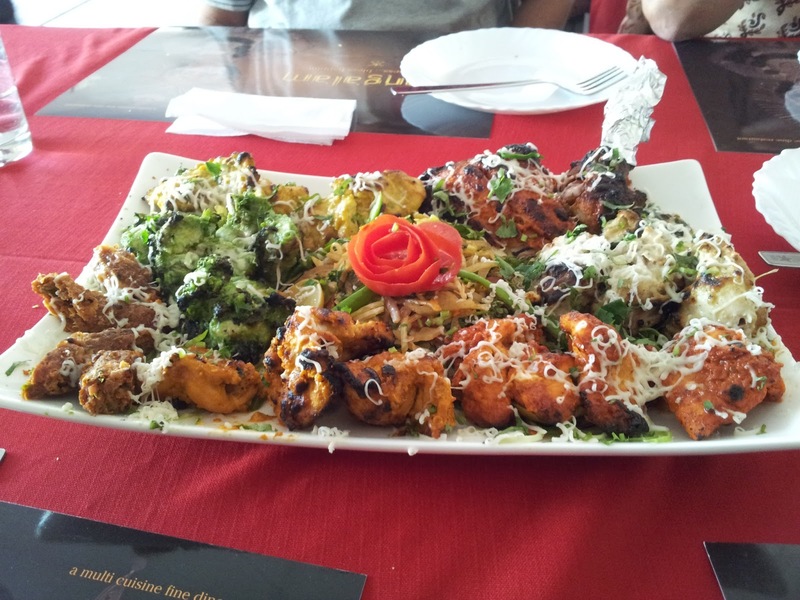 The platter was a combination of all types of chicken tandoor dishes on the menu. We are always struggling to stick to our "dieting" plans along with enjoying good food and this helped us in our endeavor or so we thought. Jokes apart the platter was delicious. The chicken absorbed the flavours very well and the tandoor was cooked just right. This is how it looked like before it was over in no time! This time we decided to hit the menu card again to try out something other then chicken and settled in for the Mutton Puli Munchi. Very honestly I'm not fond of trying out lamb at new places. Lamb is a delicacy which I prefer ordering in restaurants where I frequent. The reason being lamb has to be perfectly cooked or its a lost dish. To my delight we had chosen wisely here. The dish not only had mouthwatering aroma but also had a unique tangy spicy flavour which made it so delicious. Steaming hot Mutton Puli Munchi with Neer dosas to go with was the perfect combination. Though we were happy and full by this time, I decided to go for a fruit salad to satisfy my sweet tooth. Nothing impressive about it plus it had a lot of papaya which I'm not too fond of. They could have done something better with this simple dish.